Penguin’s Family begins in Peru, home to the Humboldt Penguin family. His parents teach Baby Penguin how to survive. It is not long before baby wanders off to explore fishing and encounters danger!This app is presented by Oceanhouse Media. The app is another supporter of reading readiness with it’s feature of highlighted and pronounced words and images when tapped. 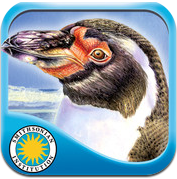 This app is part of the Smithsonian Oceanic collection and includes a glossary and interesting facts about Humboldt Penguins.